IITA and the Nigerian Conservation Foundation (NCF) have long-standing relationships, covered by a memorandum of understanding, to strengthen conservation activities of the IITA Forest Center (FC) in Ibadan. Thus, the National Executive Council (NEC) of NCF held their board meeting at IITA Headquarters, Ibadan, on 6 September to discuss issues relating to biodiversity conservation and forest restoration. NCF DG, Muhtari Aminu-Kano, about to plant a tree during the tree planting exercise at IITA Tree Heritage Park. According to the Food and Agriculture Organization (FAO), Nigeria lost an average of 47.5% of its forest cover between 1990 and 2010. In an effort to address this situation, the FC organized a tree planting ceremony to commemorate the NEC meeting. The ceremony was attended by IITA management staff and guests from the Oyo State Ministry of Natural Resources, University of Ibadan, Commonwealth Forestry Association of Nigeria, College of Forestry, Ibadan, Olive Branches School, and Centre for Environment, Renewable Natural Resources Management and Research. Commending IITA for its conservation agenda, Chief Ede Dafinone, NEC Chairman said, “Based on the development that I have seen in IITA, it is obvious that knowledge exists in the institute. I congratulate IITA for its level of expertise, especially in the area of nature conservation.” The Founder of the Ogbudu Conservation Center, Onari Duke, expressed her deepest conviction that the continued information and resource sharing between NCF and IITA “will reinforce and deepen our commitment to promote the conservation of natural resources for the benefit of present and future generations.” She also emphasized the need for the development of a comprehensive reforestation strategy. 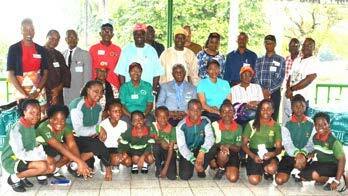 FC Manager Adewale Awoyemi briefed participants on the center’s activities and efforts on forest restoration. He highlighted the importance of sustainable development while emphasizing the need to enhance biodiversity conservation and education. In his vote of thanks, the Director General of NCF, Dr Muhtari Aminu-Kano, applauded the participants for their support and also encouraged them to work in their different capacities to ensure that forest cover is restored in Nigeria. 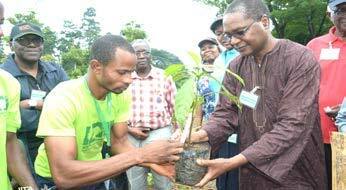 Thereafter, participants proceeded to the IITA FC Tree Heritage Park where the NEC members planted nine indigenous tree species, three of which are listed as threatened on the International Union for Nature Conservation Red List of Threatened Species. During the planting, FC interns read out a brief description of each tree. The ceremony also featured a tour around IITA and the FC nursery, bird watching, and a musical rendition by students of Olive Branches School, who are members of the FC School Conservation Club.